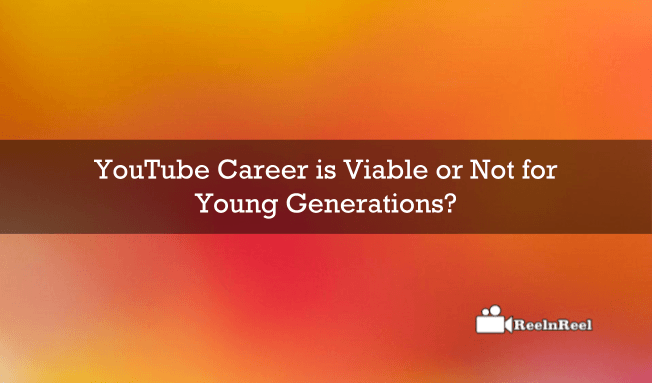 Home » Video Marketing » YouTube Career is Viable or Not for Young Generations? YouTube is the largest video-sharing platform with billions of followers. The Popularity of the platform continues to grow and many people made this a platform to earn money. There are some YouTubers who are greatly successful and are earning millions of dollars every year. However, the number of people who achieved success on YouTube is not very high. Now comes the questions is taking YouTube as a career viable for the younger generations? There are many people who achieved success on YouTube. YouTube revealed that thousands of channels are making steady revenue. The revenues are growing and will continue to grow in the future, says YouTube. With the number of advertisers increasing, fill rates and CPMS are also going to rise. Running a YouTube channel and achieving success is a time-consuming process. This is nothing less than running a small business. Depending on the niche and the type of channel, the time one has to spend differs. It is not advisable to take YouTube as a career, many people say because the internet is fickle and it is prone to change. We cannot rule out the fact that someday YouTube may fail, even if it is a huge site and dethroning it is not easy. Most people begin YouTube channel to share their skills and as a hobby and to earn some money on their hobby. Even is a YouTube channel has a large subscriber base, we cannot say the subscribers are going to be stable in the future also. YouTube can be a great place to start a career but will not work as a long-term career. People love to watch a YouTube series in the beginning and follow it until the interest fades away. This explains why one cannot depend on YouTube to support themselves. If they start making money, it is well and good and they should save and invest wisely. YouTube is not an easy job. One has to invest time and effort to get success. Success does not come overnight. Coming up with new ideas for YouTube is taxing. Success depends on how good you are at creating. Making few dollars is easy and can be done with basic equipment. Generating enough revenue to support yourself and family from YouTube is challenging. This feat is achieved by only a small percentage of YouTubers. Here are few reasons why making money on YouTube is challenging. ● There is extreme competition. More than Three to Four Hundred hours of video are uploaded per every minute on this platform. ● There are millions of videos that won’t get little or no attention at all. ● YouTube started the idea of Paid YouTube channel a few years ago. Viewers have to pay a monthly subscription to view the content on this channel. But very few paid channel are up and running now. ● The amount content creators get is only a portion of what advertisers pay. 45% of the gross revenue generated goes to YouTube. ● Ads do not run on every video view. And so all the views on the YouTube video are not monetized. Some other people say YouTube is not going to fail as it is the favorite platform for sharing the content and there are lots of people to watch the content. In order for YouTube to fail there needs to be another big site that can make the content creators move to it. There are both positives and negatives with making YouTube as a career for young generations. It is possible to generate revenue but making serious cash is pretty tough.